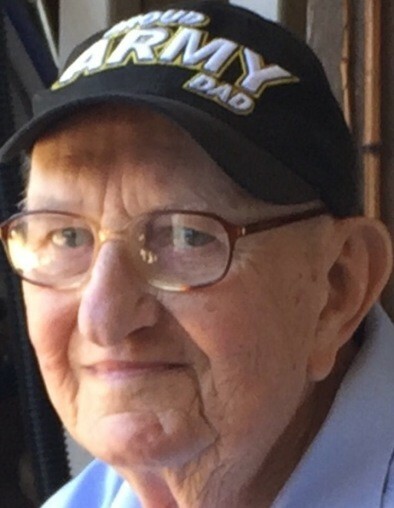 James Edward Hartman, 90, of Jefferson City, MO, passed away on Monday, October 15th at the Morrison House Hospice in Ohio. The funeral service for Jim will be held on (PLEASE NOTE THE DATE) Friday, October 26th at 2:00 PM at the Engelkes-Abels Funeral Home in Grundy Center, preceded by an hour of visitation. The committal service will follow the funeral service at the Rosehill Cemetery in Grundy Center. The family is hosting a meal following the burial at Town and Country Golf Course in Grundy Center. In lieu of flowers, memorials are suggested to Christ's Table, 28 S. 6th St., Zanesville, Ohio 43701or to Morrison House, 713 Forest Ave., Zanesville, Ohio 43701. He was born on June 15, 1928 in Jefferson City Missouri, the son of the late Peter Joseph and Lillah Victoria Burks Hartman. He was united in marriage on June 14, 1952 to Marcella Mae Getting who preceded him in death in 1982. Jim and Marcella raised six children together starting in Iowa, then Ohio and then Flagstaff Arizona. After Marcella's passing, Jim relocated back to Jefferson City and then more recently, to Zanesville Ohio. His survivors include: six children, Dan (Sheryl) Hartman of Hopewell Ohio, Chuck (Terrie) Hartman of Keller Texas, Becky (Brian) Christensen of Gig Harbor Washington, Ann (John) Kolacki of Kyle Texas, Mary (Mark) Maxwell of Stuttgart Germany, and Sara (Ron) Hill of Gilbert Arizona; 14 grandchildren, Brad Hartman, Tony Hartman, Kyle Hartman, Nohea Hartman, Matt Christensen, Mike Christensen, Katie Christensen, Lucas Kolacki, Connor Kolacki, Marcie Kolacki, David Maxwell, Kyle Hill, Ryan Hill, Alyssa Hill; six great-grandchildren, Caleb Hartman, Abby Hartman, Owen Hartman, Isaac Hartman, Chloe Christensen, Nick Hill; four siblings, Mary McLean, Jerome Hartman, Pete (Lillian) Hartman and Helen Polly Prey. He was preceded in death by four sisters, Anna Call, Virginia Luebbert, Lucy Luebbering, and Dorothy Jackson and two brothers, John Hartman and Charles Hartman.